Stream anime episodes online for free, Watch One piece Episode 13 English version online and free episodes. Anime Episode guide One piece Episode 13 English dubbed The Black Cat Pirates The episode opens with Kuro waiting impatiently in front of Kaya’s mansion. 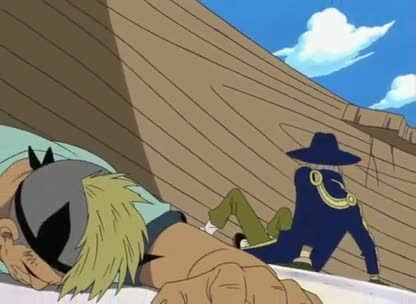 Usopp is amazed with the power of the Straw Hats. Luffy and Zoro stand together, ready to take down more of the Black Cat Pirates. However, Django kneels beside the fallen pirates and starts to hypnotize them. Once the hypnotism takes effect, the pirates became wild and ravenous, and foaming at their mouths, they charge at the Straw Hats. One pounds down a cliff with his fist. Zoro says that he and Luffy will handle it, but Luffy was also hypnotized, becoming a wild animal himself.